A useful practice tool that could potentially lend itself to onstage use, too. Sturdy build. Excellent for practice and jamming along to songs. Significantly lower price point than the combo. Like the Line 6 AMPLIFi amps, the new AMPLIFi FX100 floor pedal has a unique feature set: the ability to receive streamed audio wirelessly from any Bluetooth-enabled device and integrate with the AMPLIFi Remote iOS app. "Running on a paired Apple device, the app lets you control and edit all parameters of the AMPLIFi hardware and share tones"
Running on a paired Apple device, the app lets you control and edit all parameters of the AMPLIFi hardware and share tones with the wider web- connected Line 6 community. The stoutly built FX100 comes equipped with 100 preset sounds arranged in banks, and the number of the current bank appears in the small display. The four presets in each bank are selected with four footswitches, and banks are changed by pressing two footswitches at once. In addition, there's a tap tempo footswitch and a treadle that can operate both as a volume pedal and a wah. You also get an array of six knobs to instantly tweak the basic parameters of any preset, and a large master volume knob that doubles as a mix knob between your guitar sound and any audio that you might be streaming. You have various connection options, including headphones or a stereo output to a music system for your guitar sound and streamed audio together. There's also an output to your amp for conventional use, which operates in conjunction with streamed audio sent through the stereo outputs. The sounds found here are not Line 6's latest HD sounds, but there are lots of nicely programmed presets that instantly make you want to play guitar, plus a massive array of amp, effects and cabinet models to create your own sounds. "The unit's Wi-Fi connection will go online and find a tone that will suit the song you are playing back"
With the iOS app, it's dead easy to choose items for the blocks (noise gate, wah, amp/cab, compressor, EQ, volume, modulation, delay, reverb) in the signal chain, change their order and tweak parameters. We see the main use of the FX100 as for practice and, with the app, you get a music player with which you can choose a song from your music library and play along with it, possibly making use of half-speed playback and the tone matching facility, which utilises the unit's Wi-Fi connection to go online and find a tone that will suit the song you are playing back - there are plenty on the Cloud for more well-known songs. There's also the possibility of using the FX100 for live work straight into a PA, or into an amp if you set up presets with no amp/cab simulation. Combining a streaming music player and guitar processor is a fine idea if you want to jam along with your favourite songs. 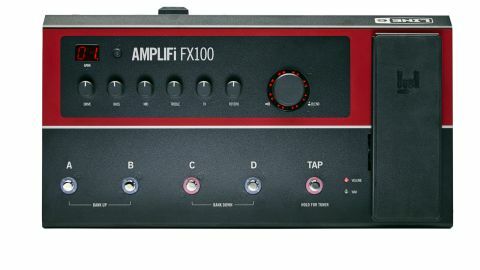 If you don't need the speakers, the FX100 gives you that facility at a much lower price point than its combo siblings, and is also a practical portable item for onstage use. The future is here.